The Town of Basalt invited all Basalt citizens, youth and business owners to join in a ground-breaking process of envisioning the future of its historic downtown core. The community has taken the lead in imagining and designing downtown Basalt. Anyone who was interested took a map and drew their ideas of what downtown, its parks and trails should be. The results of this public input process will be reflected in an action plan to make the community’s vision happen. A kickoff community meeting was held on Monday, February 24th at the Basalt Regional Library. At that meeting the Community Process being used was outlined – which includes, neighborhood chat sessions, group chat sessions, open houses, and the Our Town Planning website to keep you updated. 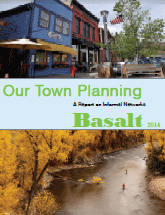 The Town of Basalt is halfway through its unconventional urban planning process. In February, Town officials invited residents to participate in what they’re calling the “Our Town” process, where they lay out a map of downtown and ask people what they’d like to see there. So far, more than 300 people have offered up ideas. They are zeroing in on a 12 acre chunk of public-private land that runs from Old Pond Park to Basalt Grocery and the Aspenalt Lodge. Aspen Public Radio’s Marci Krivonen spoke to Basalt Town Manager Mike Scanlon. Listen to the interview. 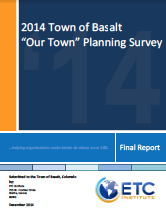 The Town of Basalt held its Summary Planning Meeting on Thursday, May 29th at the Basalt Regional Library. A cross section of the Basalt Community presented their ideas, including school children, a representative from the Arts Community, representatives from the Town’s P&Z and Parks Committee, and other citizens. The Town Manager wrapped up the meeting by inviting the community to vote on which of three site plans best represents their vision of Downtown Basalt. for the purpose of reviewing updated information on the proposed CSC Zone District for parcels within the Our Town Planning Area. This report focuses on the activities of the Citizens’ Center Team, headquartered at Clasen’s Corner (174 Midland Avenue), which engaged people from the Basalt area in a variety of ways to elicit their thoughts and ideas about possible redevelopment scenarios. Chat sessions were held in homes throughout Basalt’s neighborhoods, scheduled one-on-one conversations took place in gathering places and ideas were discussed with the many visitors that dropped in at the center to voice their opinions and draw their ideas for the town. Having a physical center conveniently located downtown was a key decision for this planning effort. Walk-in access and large display windows and walls provided easy opportunities for citizens to participate in the process. Providing tools such as maps of the subject area (particularly the ones with the parcels in question shown as blank) encouraged townspeople to participate and take ownership in the concept of change. Desired Development; How do we convert pictures into development? Wondering how you can still get involved in the Our Town Planning process? See: Participation. See visions and ideas from past community meetings.